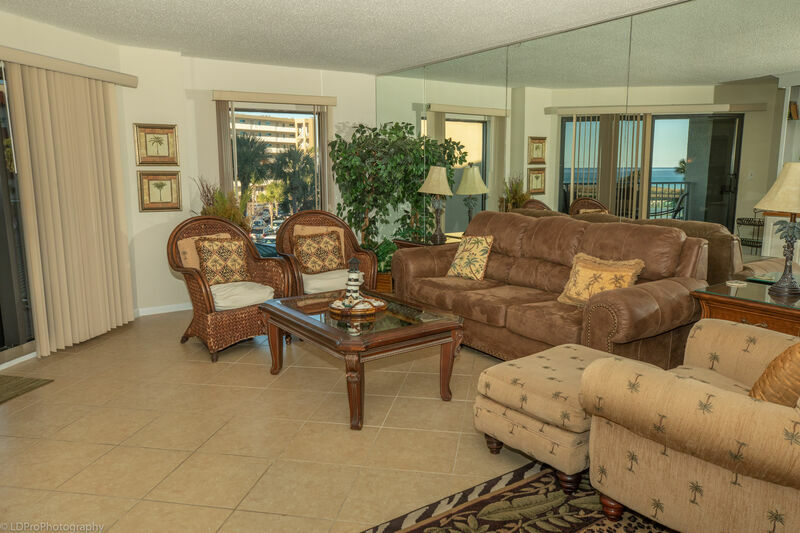 If you are looking for an expansive two bedroom, two bathroom pet friendly beachside condo with amazing views of The Gulf of Mexico, look no further than Inlet Reef 217. When you enter the condo, the first thing you may notice is the Kitchen on your right. The Kitchen is superior to most condos in Destin and offers a plethora of counterspace. It also comes with full size appliances and all the pots, pans, dishware, and silverware needed to prepare your favorite feast. The Kitchen also has a small breakfast table set for two and a full-size washer and dryer. While the Kitchen is on your right, the Guest Bedroom and Guest Bathroom is on your left. The Guest Bedroom comes with a King size bed and a wall mounted flat screen HDTV. The Guest Bathroom has a bathtub/shower combination. Moving down the hall and you come to the Dining Area and the Living Room. The Dining Table is situated under a beautiful light fixture and has seating for six guests. The Living Room comes with a sleeper sofa, access to the balcony, and a flat screen HDTV. Finally, we come to the Master Bedroom Suite. This Master Bedroom has it all: King size bed, a flat screen HDTV, access to the balcony, and a makeup area with a vanity and sink. The Master Bathroom comes with a granite vanity and a walk-in shower. As large and in charge as this two bedroom beachside condo is on the inside, the true beauty remains outside on the condo’s hexagonal shaped airy balcony. Complete with a wet bar and an outside dining table set for four, as well as a lounge chair, this balcony offers views of the Gulf of Mexico and Inlet Reef’s pool. With all the things going for this condo, it will not remain available for long, so if you happen to stumble upon this hidden Destin gem, book now while you still can. You will not regret your stay. You’ll be in Heaven in Inlet Reef 2-1-7! Loved the property. Very nice and clean. Inlet Reef #217 is a very nice place to stay. Very clean and plenty of room. Would stay again.